Chocolate puppy treats for humans! Puppy Pals is a new chocolate line created in order to help raise awareness and money for Guide Dog Australia. 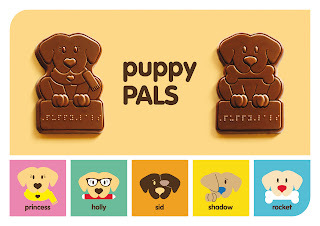 The Puppy Pals name is printed in braille on the chocolates. This resonates, as donators relate the visually impaired experience with the cause they’re helping. It’s a win-win! These are cute, and I believe they taste yummy. And it's for a good cause, so it's a win-win deal for everyone. This concept is definitely awesome!